The Yankee Robinson Shows and Circus came to Grantsburg on August 6, 1909, according to a news item in the Burnett County Sentinel. This was a big event in this area, and it was well advertised. It drew large crowds from surrounding communities such as Trade Lake, Falun, Wood River, and elsewhere. The first train load of animals, elephants and material arrived at 6 am. One hour later the second train arrived containing all of the circus apparatus. 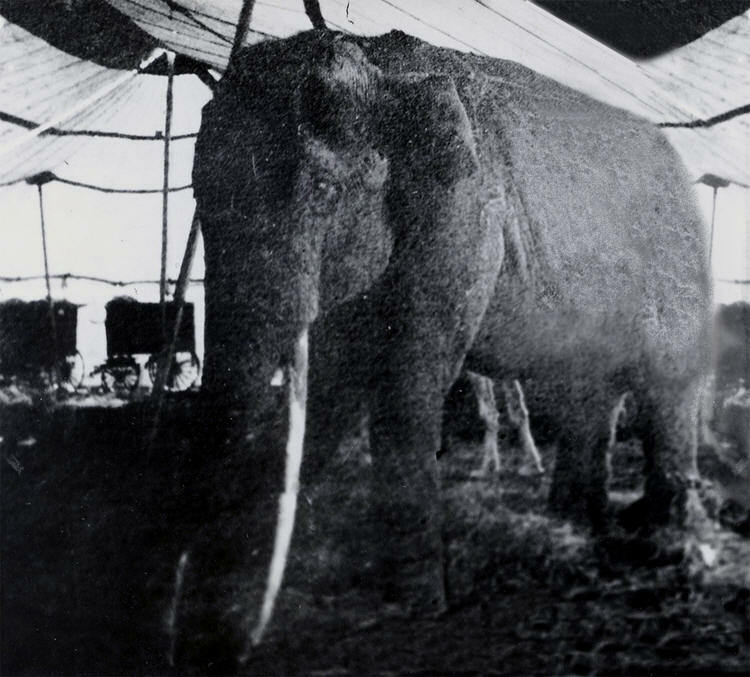 The tents were erected by 9 am in the morning so early visitors could take advantage of the morning shows and other attractions which followed the big circus. The circus posters advertised three rings and two elevated stages, with a 'double' herd of elephants. The largest elephant, Tom Tom, was advertised as being 11 feet tall. The posters told of the biggest lions in captivity, a herd of sacred cows and camels, 30 Salome Dancers of Egypt and 50 clowns headed by "Big Yulivan". An item in the Sentinel stated: "When a big wagon with the Yankee Robinson Shows gets stuck in the mud and 20 to 40 horses cannot budge it, six of the elephants, Tom Tom, Dutch, Queen, Mary, Little Tom, and Bolivar get around it. If the wagon does not move with these elephants, there is no use attempting anything else. So far, these elephants have never failed to move a wagon that has been stuck in the mud." Another source of excitement was the expected appearance of an airship at this event. A paragraph appears in the Sentinel with the heading "Airship is Coming." It reads: "You have been reading for a year about airships and aero planes. You have read where Wilbur Wright has sold the aero plane rights to the armies of France, Germany and Russia. The airship is now a certainty and practicable, so sooner or later some up-to-date circus will carry one for the season and demonstrate it to the public. Yankee Robinson Shows, at an enormous expense, has secured the identical ship that made circus history by flying around the Eiffel Tower in Paris. It will exhibit this machine and its workings before the people who congregate here on this day. This will be one of the greatest sight you have ever witnessed in your life and it may be years before you see one equally as great."